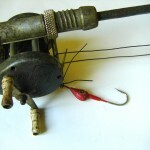 I love fishing lures (vintage and new alike) as much as I love corkscrews probably because they’re small, beautifully designed and utilitarian again, much like the corkscrew. 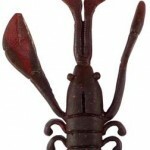 A little dangerous piece of art that also gives you dinner. 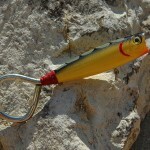 Not that I ever use them and yes, I live close to the beach but don’t fish, I just like looking at them. 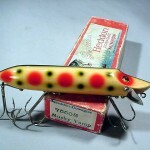 Of course the vintage lures are stunning. 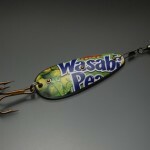 Occasionally I go to Ebay and check out their vast selection and before long, I’ve been looking at lures for hours. 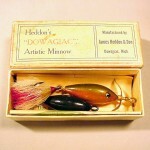 They’re fairly pricey and every time I search, there’s always an old tackle box someone dug up full of old lures going for staggering prices. 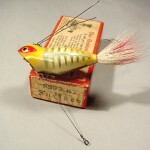 Here’s a few beautiful lures from: oldfishinglure.com. The boxes alone are just as beautiful. 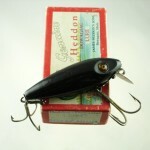 Here’s some of the lures I bought on etsy recently, certainly not Heddons (they do have a few there) and not as old but still quite cool. These are going in a book I’m working on. 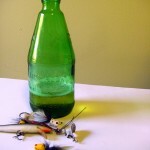 Of course, I had to incorporate one with an old Rolling Rock bottle I found and I had to buy an old fishing pole. 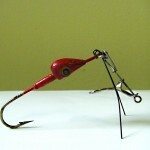 The red lure looks like a cartoon character and could possibly be a good premise for a new show; the life of fishing lures down at the pond. I can image the Ren and Stimpy guy drawing them! I also ending up taking photos of a 1960’s motor boat that was given to a friend recently. 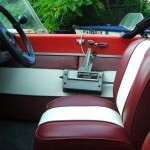 That sounds like a perfect day, drinking beer and fishing in your vintage motorboat. 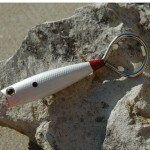 Below are 3 great new rubber ones, I especially love the minnow. 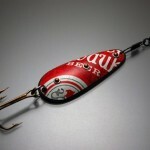 I found this seller (aperkins) from etsy who makes the lures into bottle openers, the perfect combo! Again form meets function.